What happens when Lovina accidentally sleeps in—until 6:30 a.m. It is already Thursday forenoon, and I still don’t have this column on its way! I made an attempt to write it last night after everyone went to bed, but I kept dozing off. I finally gave up and decided I would write it this morning. Well, my day didn’t start out as intended. I woke up at 3:00 a.m., packed my husband Joe’s lunch, and went back to bed after he left at 3:40 a.m. I set my alarm for 5:30 a.m. Sons Benjamin and Joseph are helping nephew Noah and his construction crew at my sisters’ house today. They will be repairing everything that was burned and damaged when lightning struck their house on April 29 and caused a house fire. Noah told the boys to meet him there at 6:30 a.m.
At 6:30 a.m., son Benjamin woke up, and I was still sound asleep. He woke me up and said he thought we overslept. He jumped on his bike and left while Joseph quickly milked our cow, Bessie, before he left. Bessie had to be in the farthest corner of the pasture field, and she seemed to walk slower to come up to the barn. It probably just seemed that way, since Joseph was in a hurry. But if there is actually such a thing as picking a good day to oversleep, today was such a day. On other days, a driver for the crew would have had to wait for them. Joseph was on his way thirty minutes after Benjamin left. I sent their water jugs with Joseph and told the boys we would send them something for lunch since I didn’t get their lunch packed. On warm days like this, they like meat and cheese roll-ups. I use soft tortilla shells, add some ranch dressing and meat and cheese and roll them up. Other than maybe a few protein bars, the boys don’t want much else in their lunch. It gets too warm to eat, and they would rather wait until we have supper. I decided that since I made the boys late, I would send a morning break to all the workers there. We made breakfast burritos, iced tea and coffee, and the girls took it over to my sisters’ house. Daughter Verena has been going with sister Susan on house-cleaning jobs the last few days. Sister Verena is laid up and under doctor’s care. Some tests were taken. Hopefully she will soon be on the mend, but for now she has to keep her legs elevated. Sisters Verena and Susan are still staying here with us since their house fire. They will be glad when they are able to get back to their own house after it is finished. Son-in-law Mose is keeping the garden watered on dry days. Our soil is sandy, so it dries up the moisture really fast. We replanted cucumbers as some plants died off. It seems everything is a little late this year. We are having a nice, steady, drizzling rain right now. I am writing this column in my bedroom at my desk. If too many people are around, I need to get away from all the noise so I can think better. Then again, I can’t get too relaxed or I’ll start falling asleep again! I’m glad we did laundry yesterday when it was nice outside. We are starting to do laundry three times a week. The boys need more work pants, so until I get more pants made, I need to do laundry more often. Daughter Elizabeth and Abigail came for the day yesterday. It looks like Abigail’s first two teeth are finally ready to pop through. My children always had teeth before they were her age. She keeps rolling her tongue where the teeth are coming through. She probably feels the tiny bumps. Her sounds are really coming out, and she just gets sweeter all the time! 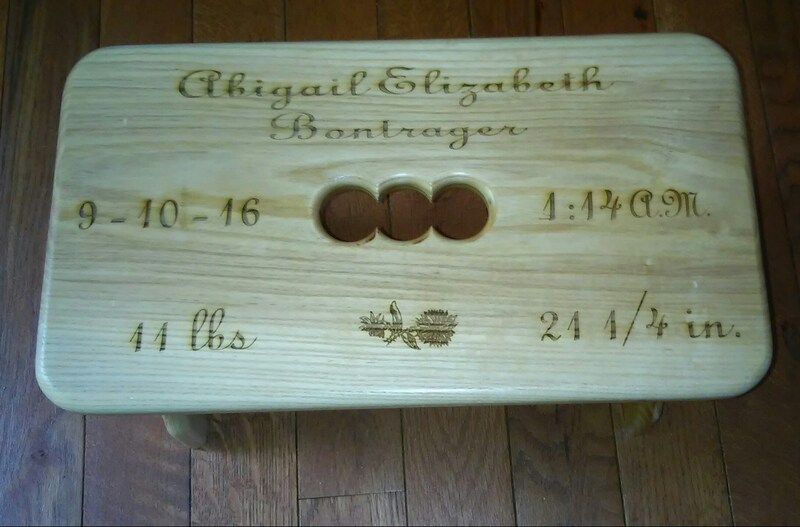 The bishop for Lovina’s Amish community made this beautiful little bench for baby Abigail Elizabeth. The bishop’s wife’s name is also Elizabeth. Try this recipe with your zucchini this year. God’s blessings to all! Beat together eggs, sugar, oil and vanilla. Beat in soda, salt and baking powder. Mix in flour until well mixed. Stir in zucchini. Pour into greased 15x10x1-inch pan. Mix together brown sugar and butterscotch chips and sprinkle over batter in pan. Bake at 350 degrees for approximately 30 minutes or until it tests done with a toothpick. Previous PostHot, humid days mean it’s time for haying—and a water fightNext PostThat time the toddler conspired to free the baby from the playpen . . . The bench is beautiful. What a thoughtful gift. Everyone deserves a few extra “winks”. Especially, a good, hard working woman like you, Lovina. Thanks for your wonderful lines. Praying for your whole family that your summer will be filled with blessings.